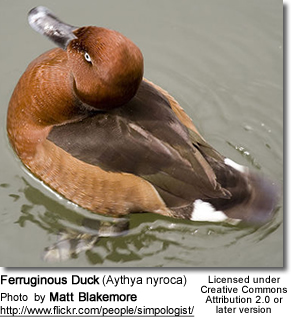 The Ferruginous Duck (Aythya nyroca) is a medium-sized diving duck. 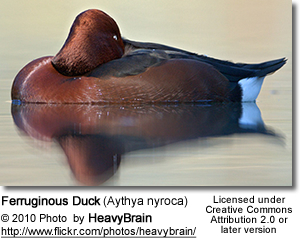 The Ferruginous Duck is one of the species to which the Agreement on the Conservation of African-Eurasian Migratory Waterbirds (AEWA) applies. 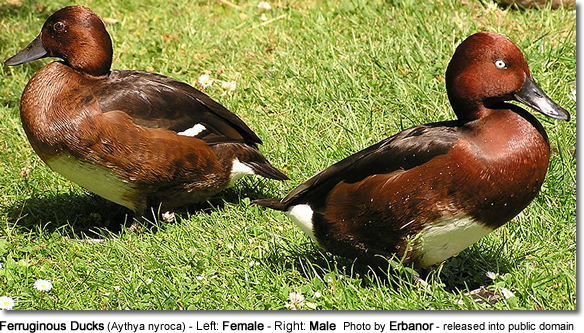 The adult male is a rich chestnut color with a darker back and a yellow eye. The pure white undertail helps to distinguish this species from the somewhat similar Tufted Duck. The female is similar but duller, and with a dark eye. These birds feed mainly by diving or dabbling. They eat aquatic plants with some mollusks, aquatic insects and small fish. They often feed at night, and will upend (dabble) for food as well as the more characteristic diving.ts, crustaceans and pond vegetation. Copyright: Wikipedia. This article is licensed under the GNU Free Documentation License. It uses material from Wikipedia.org ... Additional info provided by Avianweb.